Child girl in sunglasses is eating ice cream while sitting on a bench in the park on a sunny summer day. Portrait of a baby close-up. 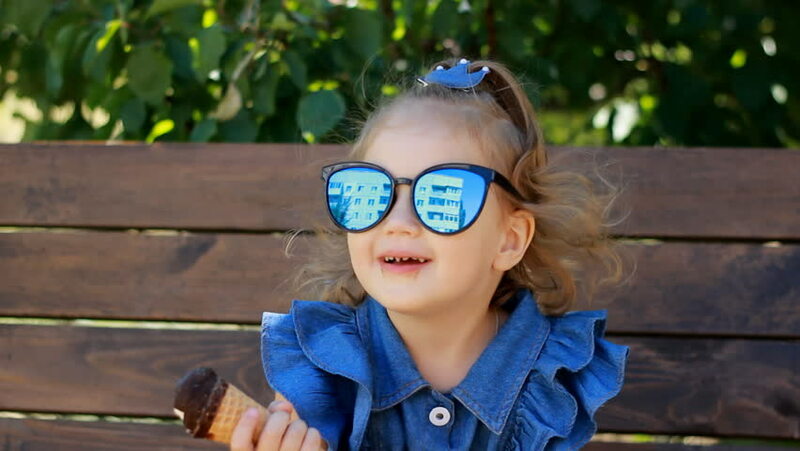 hd00:15Child girl eats ice cream in sunglasses on a sunny summer day. hd00:29Child girl in sunglasses is eating ice cream while sitting on a bench in the park on a sunny summer day. hd00:10Sisters in the park. A young artist paints in nature. The child is playing on the tablet. hd00:10Child girl sits in a stroller and drinks a milk drink from a bottle or kefir. hd00:15Child girl drinks a milk drink from a bottle or kefir, smiles and shows a white mustache from yogurt. hd00:12Happy child girl jumping on a trampoline on a children's playground. hd00:10Child girl jumping on a trampoline and playing in a country house. Games for children. hd00:15Happy child girl jumping on a trampoline on a children's playground.